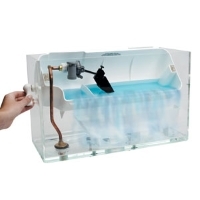 The N2225T EcoLogic Flapperless Toilet Tank from Niagara Conservation is a High Efficiency tank that uses only 1.28 gallons of water per flush. The revolutionary technology erases the need to maintain or replace a flapper, chain, or lever. In addition, the toilet never leaks and a sweaty tank will be a thing of the past. The tip-bucket function allows for a high-performance flush using only 1.28 GPF, greatly decreasing water usage in your home or building. With one flush, the bowl is cleared every time. It is designed to fit both 10 5/8” - 12” rough-ins with ease.